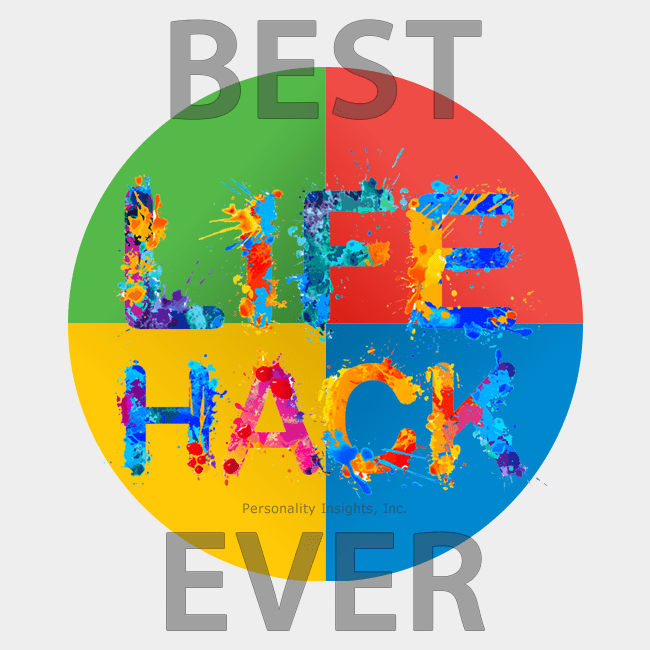 DISC – The Best Life Hack Ever! Home DISC – The Best Life Hack Ever! There are lots of fun, interesting life hacks that show up online. Most hacks are little more than curiosities – a bit of interesting trivia such as 15 ways to use a paper clip. Hacking is a term that originally started in the world of technology and computers. It was a word used by programmers who figured out clever ways to make a computer do something that would otherwise not be possible or might take much more time or effort to accomplish. Some personality concepts do a good job of describing various categories of behavior. 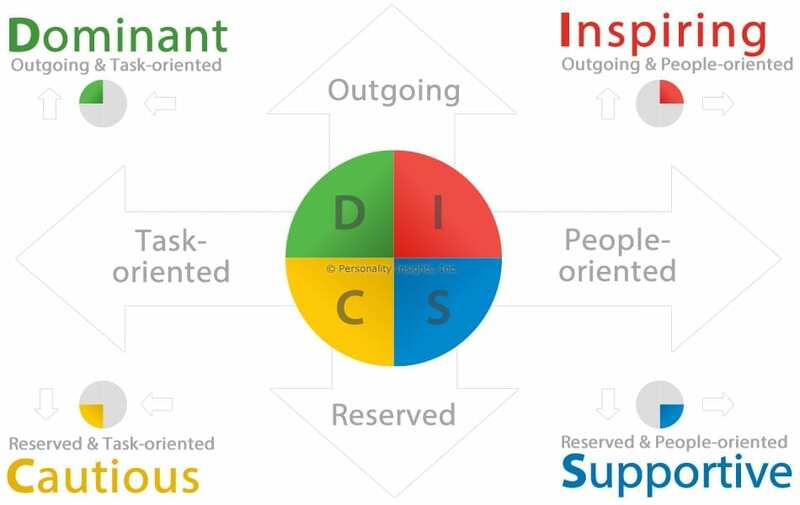 DISC excels as a concept because it is based on a visual model with contrasting traits. You will see the contrasting traits of being “Task-oriented” shown on the left side of the diagram and “People-oriented” shown on the right side. You will see the contrasting traits of being “Outgoing” shown at the top of the diagram and “Reserved” shown at the bottom. We believe that the real power of the DISC Model of Human Behavior lies in it’s simplicity. As you look at the diagram, look again at the contrasting traits. A person’s tendency toward being either Outgoing or Reserved can be directly associated with the PACE of that the person. Outgoing people are faster paced while Reserved people are slower paced. Likewise, a person’s tendency toward being either Task-oriented or People-oriented can be directly associated with the PRIORITY of that person. Once again, the difference between a Task-oriented person and a People-oriented person is a matter of PRIORITY. Think of PRIORITY as one’s internal compass. A Task-oriented person focuses on getting things done while People-oriented individuals focus on relating with others. Both types of behavior/focus are important, but they are very different in nature. The vast majority of conflict occurs from a difference in PRIORITY/FOCUS. And, just to be clear, we are not talking about more important priorities versus less important priorities. We are talking about different priorities at a given time in a given exchange between two people. Let’s use a simple example: Imagine a person walking into a store and being approached by super-friendly, talkative People-oriented greeter who starts the conversation by saying, “Hey, how are you doing today? I’m so glad you came in. We have lots of things on sale. Can you tell I am so excited that I only have 5 minutes before my break? How is the weather out there? I heard it was going to rain. I like your shoes!” You get the idea. If the shopper who walks in is Task-oriented, then he or she may immediately feel frustrated and think that the greeter is wasting time and getting in the way of the objective of buying the items on the list. What the greeter intended to be a friendly exchange could instead backfire in the form of a conflict due to a mismatch in priorities. All the greeter wanted to do was make shoppers feel welcome, but the end result may not turn out that way. On the other hand, if a shopper who walks in is People-oriented, then he or she may feel happy to be welcomed by the greeter and gladly join in the exchange. In this scenario, there would be match of two People-oriented people. And so, the greeter in our story may spend the day making some shoppers happy and irritating others – all the while not knowing what is really taking place inside the minds of each customer. Conflict between two people is often not easily resolved after the conflict exists. It may take some time to patch things up, and that is a topic for another day. However, conflict can be greatly minimized when we learn to ADAPT to the PRIORITY of another person so that we can engage with him or her in a way that matches his or her focus at the time. Let’s explore the major “life hack” that you can take away from this article – which is … how to adapt the to PRIORITY of another person. Explain the purpose of the conversation or what is on the agenda. Give a time frame and get down to business quickly. Follow through on your commitments. Don’t take their Task-orientation personally. Instead, think in terms of helping them reach their goal which is their focus/priority. Saying, “Good morning,” before going through your task list. Showing genuine interest in him or her as a person. This life-hack may seem simple, but it does require some practice. We encourage you to consciously and intentionally ask yourself the question, “Is this person more Task-oriented or more People-oriented at this time?” The more you interact with others with an active awareness of the focus of the other person, the more you will be able to connect with him or her in a way that is effective. Try this “PRIORITY-adjustment” life hack for a few days. Really! See if you don’t find yourself working with people in much better ways – much to their delight. And, if you think about it, contact us and let us know how it goes!